Treat you clients, your employees or your customers the special way and be one step ahead of your competitors. Limotions offers you a really special way to remain positive in the mind of your customer - our Corporate Transportation service! Pick up your clients from the airport in a Limousine or a Limo Bus. Visit a real estate and properties in a stretch SUV or presidential style Limo. Go out in Town for dinner or to a sporting event. Whatever you are planning we make it possible. This is what you get from Limotions corporate Limo service. We are specialized in meeting the needs of today’s frequent and business travelers but also executives and corporate groups. Our experienced customer service team and professional chauffeurs concentrate it's efforts in providing you with high-quality Corporate Limo services. This includes reliable door-to-door and business shuttle service to conference destinations. But also to and from airports, hotels, trade shows and business areas throughout the city. Travel at ease and let Limotions do the driving. You are a frequent traveler? You often need transportation to and from airports? Your employees need to travel a lot? 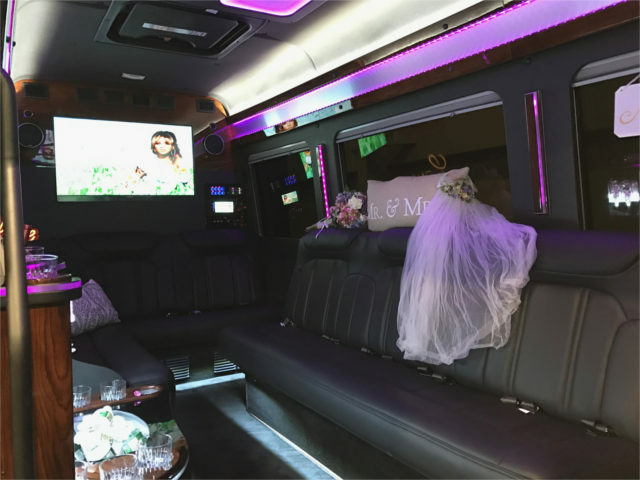 Therefore Limotions has the perfect Limousine solutions for your business. How it works? You purchase and prePay a certain amount of service hours on your account. Every time you need a Limousine from Limotions we will deduct the service hours from your account. The advantage of this package is that you get a better pricing and priority booking on short notice reservations. In addition you get the “Mobile Office” option by default. We know comfort and full-service transportation! In order to meet your needs as business traveler our Limos are equipped with high-speed WiFi internet. In addition, you will find magazines and an IPad to make your travel time comfortable. A privacy partition in selected Limousines provides you the quiet you need to work and have business phone calls. These and more amenities will make you believe that you work in your office. Please ask for the “Mobile Office” option upon your reservation. Limotions focus on reliable high-quality Limousine service. Vehicles: Our vehicles are state-of-the-art and well maintained in a timely manner. Chauffeurs: Your Chauffeur always come dressed appropriately and excels in customer service while providing you with the most reliable on-time service. Payment Options: We offer all common payment options and give you the flexibility to choose a billing method that meets your needs best. Individual: We offer different business packages to make your business travel easy and comfortable. No stressful driving and parking issues. Also, no lines at the car rental and no worries about driving directions. Just comfortable, relaxed and efficiant. Corporate accounts helps businesses to manage their Limo transportation reservations by allowing the travel activities of multiple individual users to be billed to a single corporate account. The best service you can count on. Do you have any questions about your corporate account or need help to create your account? No problem, our friendly staff is happy to assist you at any time.